The 2018 Jeep Compass is versatile and spacious. It features a bold exterior design that shows off its athletic capabilities and turns heads down any street. Let's take a closer look at the passenger and cargo space in the Compass! 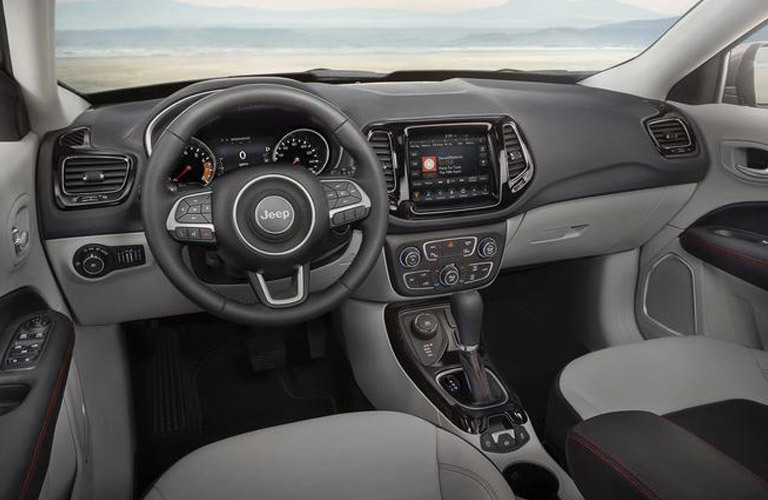 The cabin of the Compass has meticulous craftsmanship and attention to detail that gives you a high-class experience every time you get behind the wheel. Available leather-trimmed seats are offered in a selection of colors so that you can customize your interior to fit your personality. A panoramic dual-pane sunroof keeps the cabin feeling open and bright, and spans across both rows of seating for maximum viewing capabilities. Details like contrasting elements and colored stitching on the seats, front door trim panels, and center armrest show off the attention to detail that went into the Compass's design. The Compass has a variety of infotainment options for drivers to choose from to stay connected and entertained on the road. Features included in these infotainment systems include Bluetooth® Streaming Audio, Voice Command technology, an 8.4-inch touchscreen display, navigation capabilities and Siri® connectivity. Apple CarPlay® and Android Auto™ are compatible with the Uconnect systems, as well as SiriusXM® Satellite Radio. 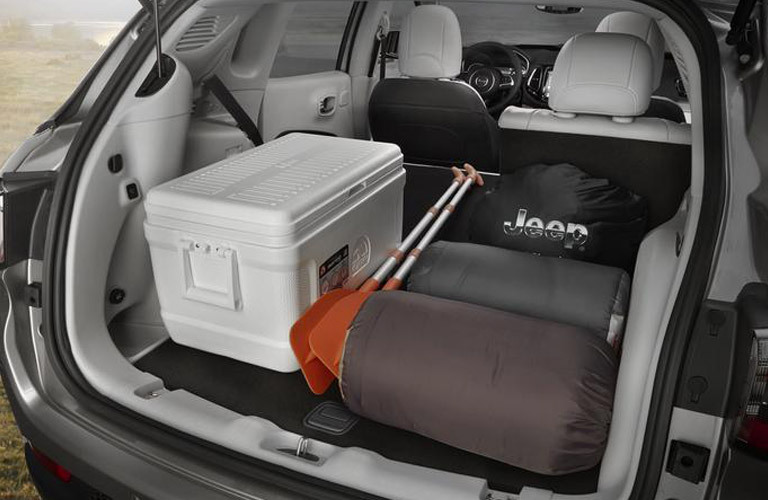 The cargo floor in the Compass is adjustable, giving you additional versatility even with the rear seats up. There are three floor levels to choose from to fit more or less gear. The rear seats have a 60/40 split-folding feature that allows you to choose between more passenger space or more cargo space when you need it. You can even fold the front passenger seat forward to make room for extra-long cargo. The Compass reaches a maximum 59.8 cubic feet of cargo space with the rear seats folded flat. First, let's look at the features that are built into your Compass's design to keep you safe. The Compass has a variety of airbags implemented throughout the cabin, including multistage front airbags, supplemental front seat-mounted side airbags, and supplemental side-curtain front and rear airbags. Anti-lock 4-wheel brakes are also standard, helping you brake safely in emergency situations, as well as rain brake support. The lighting system in the Compass helps you see and be seen, no matter how dark it is. Automatic halogen quad headlamps are standard, as well as fog and cornering lamps, which help you see around bends in the road, and incandescent tail lamps. Variable intermittent windshield wipers up front and a rear window wiper allow you to keep your sights clear from the front and the back. The Compass is equipped with plenty of active systems that work to keep you safe. Check them out here! The 2018 Jeep Compass is available now at the Preferred Chrysler Dodge Jeep Ram in Grand Haven. Browse our inventory or set up a test drive today!